Part Five contains pictures of me in the dress, so if you're one of those people that doesn't want to see it, don't read the rest! 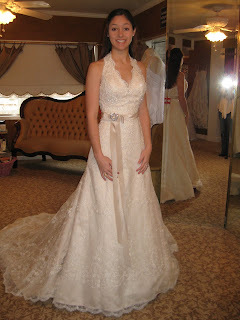 So, I was down to my last dress store, in love with an out-of-budget gown, but ready to fall in love with another dress if possible (unlike fiances, sometimes you can be in love with more than one dress!). 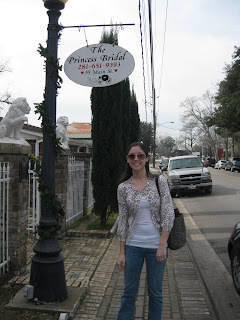 Enter, The Princess Bridal. This store is located in an old house in one of my favorite parts of Houston, Old Town Spring. 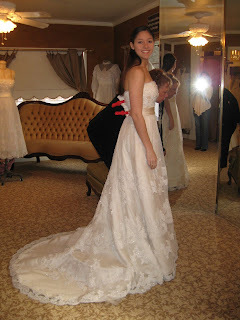 I was the only bride in the entire store during my appointment, and even though I showed up 30 minutes early they were super-helpful. My helper-consultant-person (still don't know what to call those people!) was so sweet, and when I described my dress vision to her she seemed to just get it. Thought process: "Ahhh! 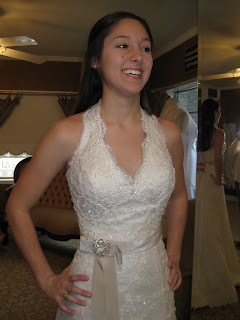 Scalloped neckline! Oooh...pretty lace. Like this dress. Really like this dress. Oh, I have to take it off? Well...can I put it back on later? Yes? Okay. Really like this dress." BUT, it made me make funny faces (see above pictures). Also it made me feel like my shoulders looked huge. Everyone tells me I'm being ridiculous and my shoulders DO NOT look huge. But I think they do. And that's what matters. 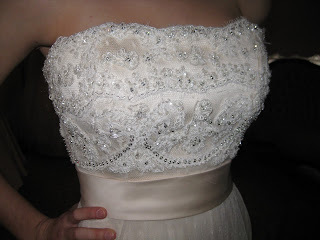 I don't want to feel like my shoulders are huge on my wedding day. Picture it without the giant red clips. Someone should manufacture industrial strength clips in white. I loved it. I didn't get a "OMG this is my dress!" feeling, but it was everything I wanted. 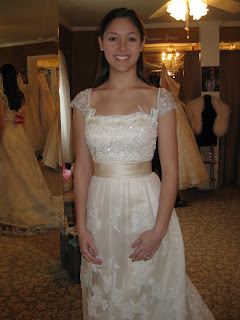 And at 1/3 the price of the Paloma Blanca dress, this Casablanca one stole my heart. Hello pretty detachable cap sleeves! Should I use these? Just for the ceremony maybe? Thoughts? Mom and I went out for a quick lunch of Mexican food (what else? ), and then went back to place the order (with 10% off for purchasing the same day!). And with that, the dress search was concluded. I had to rush-order it so it will make it in time for the wedding, and I can't wait to see it again in April! In the end, I found a dress I'm happy in. It makes me feel beautiful, it doesn't break the bank, and even though it wasn't worn by my mother and grandmother, it still feels special. 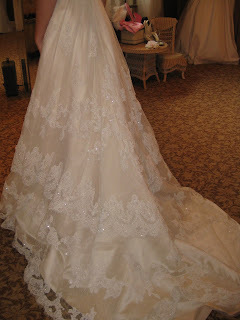 Was your dress search long and complicated? 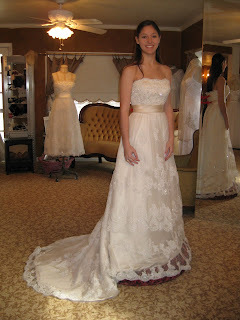 Did you have to give up an heirloom dress?